One of the realities of working with clay is… the fire. I did not set out with the intent of making a “Shattered” piece. I was just making a figure. I put a lot of time and heart into it, but I was assuming a pretty normal process. However, the creative process does not always go as we plan. At temperatures from 1607°F (875°C) to 2345°F (1285°C), there are plenty of bad things which can happen during the firing process. There may be a pocket of air trapped under the clay. If a piece isn’t left long enough to dry, there can be a little moisture buried deep within. When this pocket of air expands, or the water heats and turns to vapor, the pressure can cause a piece to crack, split or explode, potentially damaging other pieces around it. 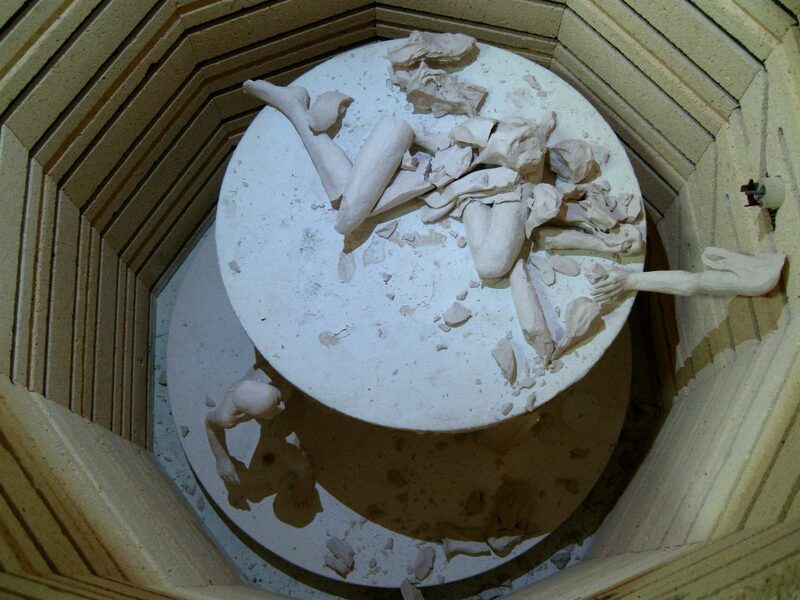 Opening the kiln is always a time of great expectation, so there’s nothing quite like feeling the rush of the residual heat as you raise the lid, and then finding… a thousand million shards from a piece that has not just broken, but catastrophically exploded. 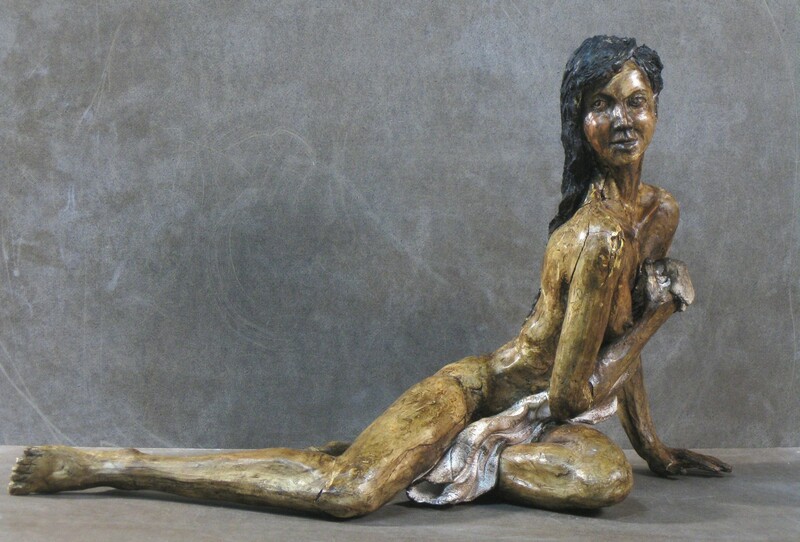 Eventually, I knew I needed to clean out the remains and recover the other sculptures I had fired. As I began to pull out the larger fragments, I discovered two that fit together. Without thinking about it, I found some glue and put the pieces together. Having spent so much time on the original figure, I recognized more fragments—a part of her face, the curve of the back, an arm, a hand—and I started gluing. I eventually pulled out the entire shelf and placed it on my work table, sweeping out the interior of the kiln to collect the tiny bits thrown off in the explosion. Slowly, pieces came together, each creating a more recognizable portion of the original figure. Things didn’t always fit nicely, and there were some holes, but after a couple of days, I was able to put the majority of the figure back together again. The figure is now both broken, and complete. While you can still clearly see the marks of her brokenness, the cracks and fissures have become a part of her — an integral part of her character and beauty. I cherish this figure, and the way it reflects our reality as human beings. All of us are “broken” in some way; through our experiences of growing up, abuse, accident, trauma, conditions of our birth, things that have bruised and battered us over time. Some of us are more adept at hiding those cracks and scars, but they are still there. But, who is the ultimate Great Sculptor other than God Himself? He finds us in our shattered state and reaches in to pick out the shards, tenderly putting us back together, one piece at a time. He is the one who creates beauty in us, perhaps more because of our visible scars and missing bits than in spite of them. They are a sign of the healing power of His hand, and the fact that, when He sees the scattered fragments of our lives, He still sees who He has created us to be, and has the patience and power to carry us forward into that truth. Posted in Sculpture, Stories and tagged purpose.